- Provides fast serviceability and reduced maintenance requirements via self-diagnosing, field-replaceable modules. - Provides high availabilty through redundancy by allowing configuration with one more Power Module than is necessary to support the connected load. - Provides higher availability to the UPS connected loads by giving redundant communication paths to critical UPS functions. 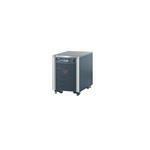 - Ensures clean, uninterrupted power to protected equipment during Intelligence Module replacement.